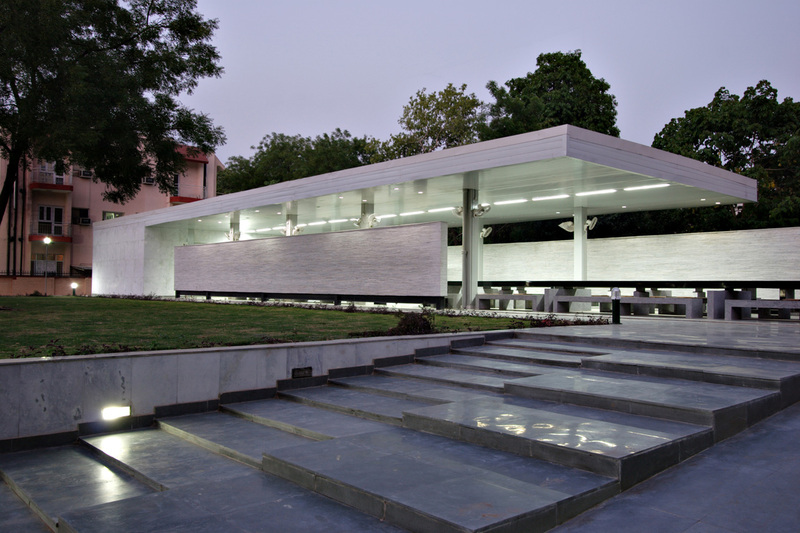 A Cafeteria in a University Campus located near Auditorium, Cultural Center, Mass communication, was expected to become hub of all social activities of the Campus. Due to the extreme climatic conditions of New Delhi, where the summer sees temperatures of above 45 degrees centigrade, and the winters often see temperatures below 5 degree centigrade. Most student canteens in India are not air-conditioned, and are often poorly ventilated, making them very hot and oppressive in the summer and very cold in the winters. 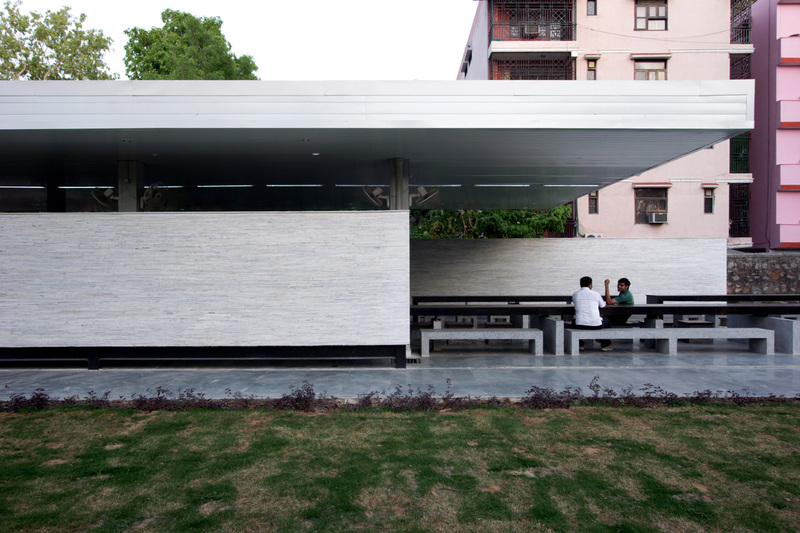 This canteen was proposed as a ‘Semi open air Cafe’. This allowed to have an ambient temperature for most of the year along with good ventilation, and a variety of degrees of shade from the climate. The design is truly unique and contemporary and we feel, will herald a new age of Architecture for the University. CafeThe building block has a kitchen block to the east, which is a fully enclosed space to cook and serve in. As One walks along the length of the building westwards, initially the eating enclosure is defined by two walls and a roof, further still the sense of interior is defined by one wall and the roof, further still the space is articulated by only one wall, and yet further still, there is only the floor, and then that too stops continuing. 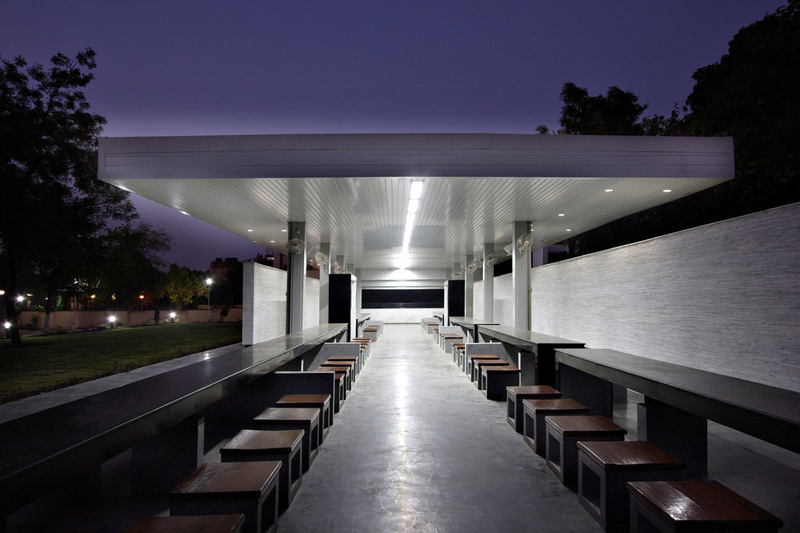 Throughout this changing sense of interior and exterior, the eating surface and the seating surfaces continue, almost acting like stitches that tie this entire space together. 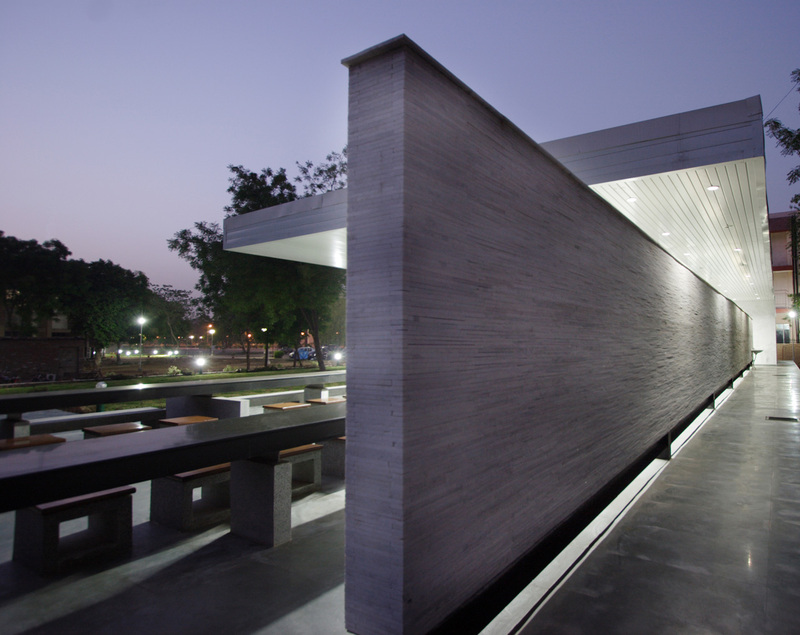 The idea was to try and blur the boundaries between inside and outside, where these undefined boundaries act as a negotiator between the user and the climate of Delhi. All the elements of the building are defined distinctly and independent from each other. The walls don’t touch the floor and the roof does not touch the walls. This was the first steel building built at the university campus. 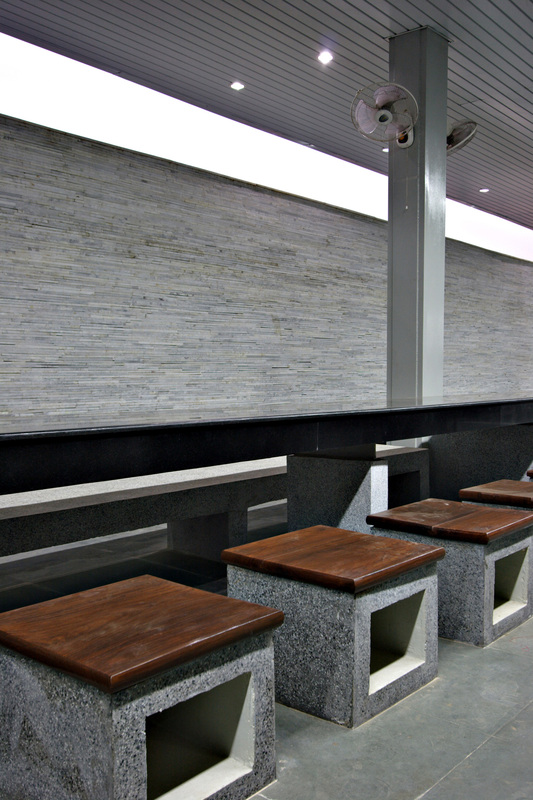 Kitchen: Marble Cladding over kitchen walls comes in handy for this kind of busiest place. Floor: Kota stone is the hardest locally available stone. Its slabs have been used for flooring, skirting, dado, risers of steps etc. keeping in view the high expected usability of the building. 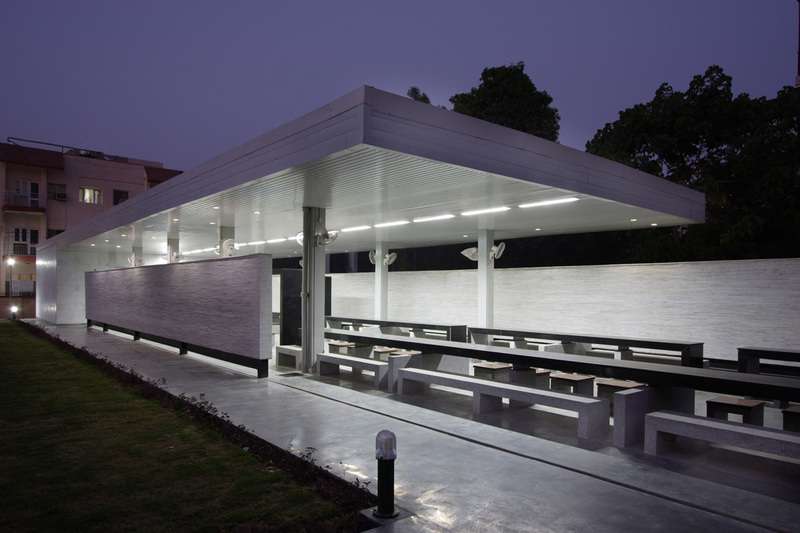 Perforated aluminum sheet has been used as a ceiling so as to reduce noise levels within the canteen. Lights have been concealed in this ceiling to achieve a clean soffit. 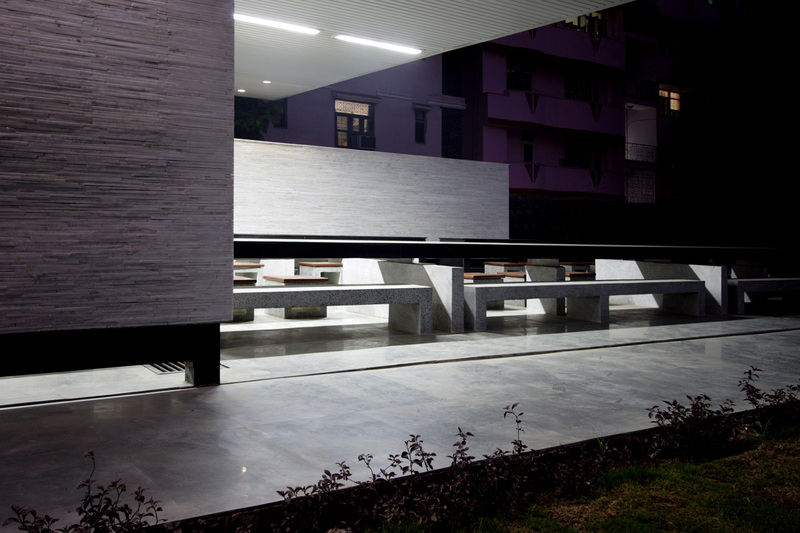 Benches: Precast RCC, with Sheesham wood tops. Tables: RCC with granite top.